Should the Amazon CEO release the photos allegedly used to blackmail him? 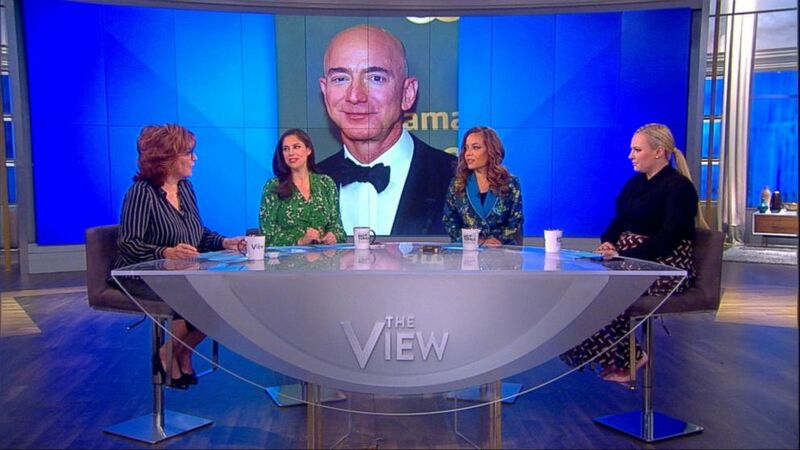 "The View" co-hosts weighed in on whether Jeff Bezos should voluntarily release the "intimate" photos he claims American Media, Inc. used to allegedly extort him. In January, The National Enquirer published an expose revealing "raunchy" text messages between the married billionaire Amazon CEO and mistress Lauren Sanchez. Bezos' lawyer told The Enquirer he and his wife of over 25 years, MacKenzie Bezos, had been "long separated," only making their official announcement Jan. 9. In February, Bezos posted a piece on Medium titled "No thank you, Mr. Pecker," where he accused David Pecker –- chairman and CEO of The National Enquirer’s parent company AMI -– of blackmailing him with threats to publish "intimate" photos, which Pecker’s lawyer has denied. (ABC) "The View" co-hosts are pictured on set on Feb. 11, 2019. A New York Times op-ed published on Sunday about Bezos’ opportunity to turn the tables on weaponizing the photos by releasing them himself gave way to an in-depth conversation about Bezos’ situation on Monday during "The View." Co-host Sunny Hostin believes there’s "no question" about it. "I think it’s very smart to get in front of this," Hostin said about Bezos releasing the "intimate" photos. As someone who formerly served as a trial attorney in the U.S. Department of Justice, Hostin used a hypothetical client with a lengthy rap sheet as an example. "You ask the witness all of the questions. And then at the end you say, 'You have been convicted of murder, correct? You've been convicted also of theft, robbery, prostitution? OK thank you very much. Your honor, I’d like to enter into evidence the rap sheet,'" she explains. "That way what is the defense attorney going to do? Start saying, 'You’ve been convicted of murder, correct? You’ve been convicted of this, correct?' I mean, you’ve already taken the sting out of the investigation." "My point is that it's not that he did something illegal, I’m just saying you take the sting of the bad stuff... release the pics!" Hostin added. "We’ve seen enough," co-host Abby Huntsman said about the idea of Bezos releasing his "intimate" selfies. "We've seen the emails of the threats. He's already said I'm giving myself up to help other people that can't fight for themselves so, I don't really need to see another photo."